Have you ever had the vacation where you said “What else could go wrong on this trip?” I think we have all had that experience. Well my family just had the “anti-could anything else go wrong on this trip?” trip. We may have had the perfect trip. Recently we were fortunate enough to spend some days at Disney World in Orlando. This was the first time for all four of us to go together. Jackson had his trip without Anabelle in 2007 and Anabelle had her trip without Jackson in 2009. We intentionally chose to do that so each could experience Disney all by themselves. It will go down as one of the best parenting moves ever by Pam and me. We were all excited about going together. Everyone was a little older and had “experienced” Disney so we all had our ideas of what we wanted to do and see this trip. We told the kids about the trip a couple of weeks prior and that added to the excitement. We decided to drive this time and the drive down was as smooth as an 8 hour ride could go. We made it through Atlanta with no delays whatsoever on a mid-morning Friday down 400 and onto I-75 and through downtown(first amazing sign). We planned a stop in Valdosta to have lunch with my aunt. She was thrilled to have us and treated us like southern royalty with chicken n dumplins, fresh butter beans, black-eyed peas, cornbread, lemon meringue and pecan pie with some good sweet tea. The trip was certainly off to a good start. We decided to do Hollywood Studios the first day and it was not very crowded for a Saturday with the forecast of Sunny and 72 degrees. The weather was absolutely perfect all week. It was supposed to rain on Sunday morning and most of the day but the front went through during the night on Saturday and cleared out for the wake-up call and we had another sunny day and 70 degrees. The rest of the week was truly ‘magical’ as the weather just got better with temps in the upper 70’s and sunshine mixed with enough white and fluffy clouds to make the days absolutely perfect. 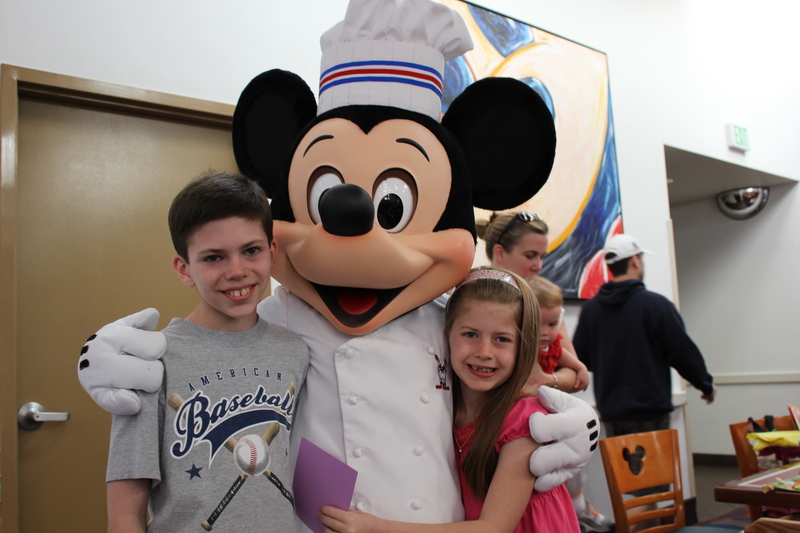 We had breakfast on Monday with Chef Mickey and got to meet the classic characters while we ate. 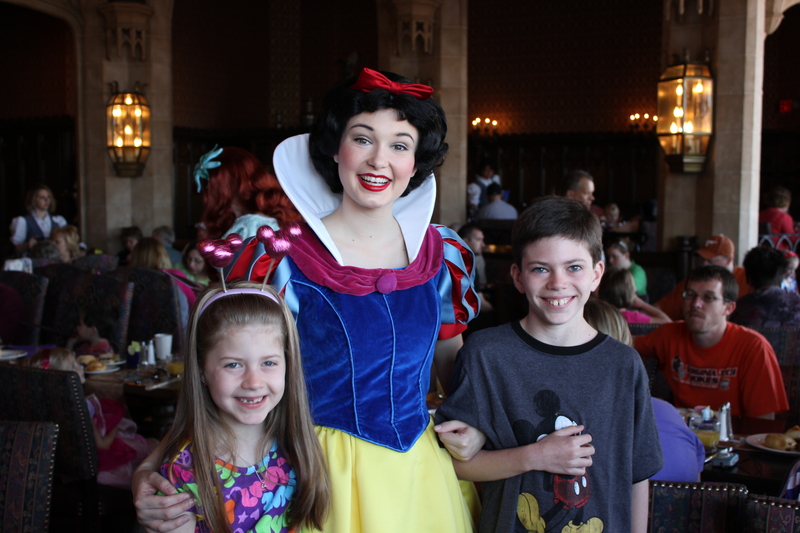 We were able to have breakfast with the princesses on Tuesday morning in Cinderella’s castle! Anabelle was thrilled and Jackson even said “this is pretty cool” once we were up in the castle looking out over the park. Two straight days in Magic Kingdom. Did everything we wanted to do and many things more than once. One of my favorite memories of the week was riding roller coasters. I love roller coasters even though I almost fell out of The Scream Machine when I was 8 years old; literally. I overcame my bad experience and I love the experience roller coasters provide. I rode every roller coaster in all the parks during the week and I was able to share my love for them with my kids. 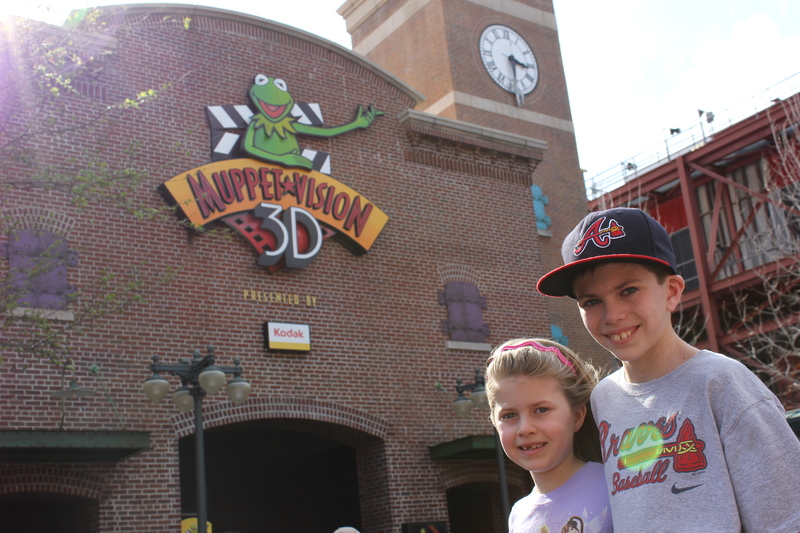 Either Jackson or Anabelle rode every coaster with me (I can’t say that about their mother:) and it was awesome! Anabelle rode Everest with me three times on Wednesday! 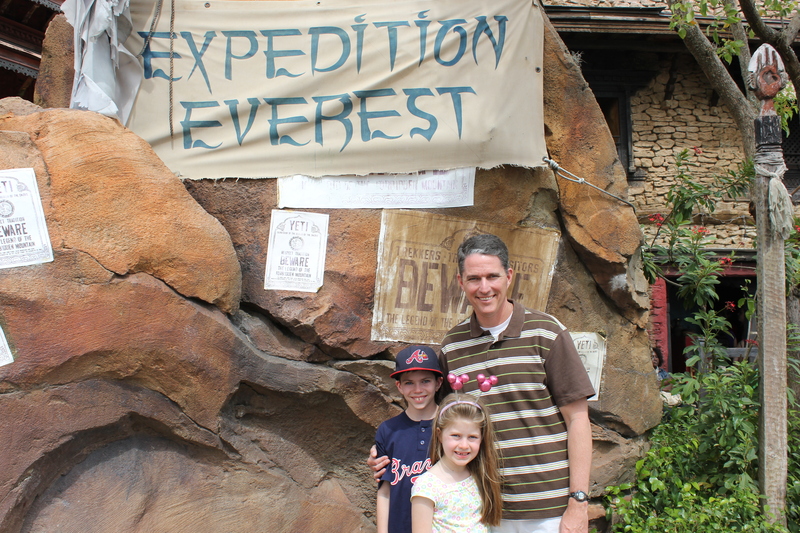 Expedition Everest rocks! She has decided she really likes riding coasters with her daddy. We ended the week on Thursday with another trip to Epcot to ride Test Track a few more times and visit a few more countries. We were able to have lunch in Japan and experience the food being prepared as we watched. This was a first for the kids and we all loved it. We exhausted the ‘Disney Dining Plan’ snacks on the final day as we all enjoyed treats we don’t normally have at home. 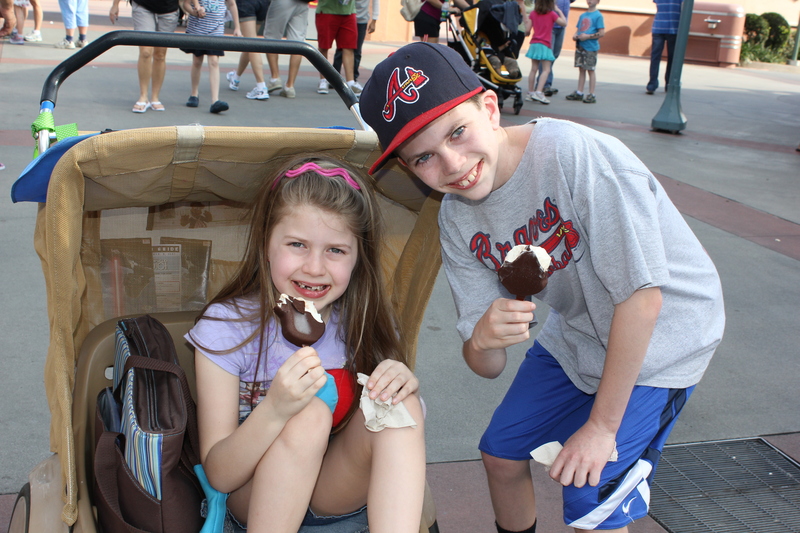 I think the kids enjoyed the ‘Disney Snacks’ during the week as much as anything else. We began our ride home on Thursday night and once again stopped in Valdosta as it is the half-way point between Atlanta and Orlando. We continued our way home on Friday morning with a short visit to where my dad is buried in Tifton. That was our first trip to visit daddy’s grave since his funeral in January of ’11. Cool experience. I miss my dad. We arrived home safe and sound and we all exhaled when we walked into our house. There’s something about returning home after being away for a while; even if the trip was wonderful. I don’t know if there is such a thing as a ‘perfect trip’ but we came as close as you possibly can. It is a trip I will never forget. I will always remember the moments with my family and how cool my family is. 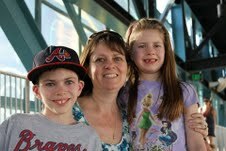 My wife is awesome and my kids just rock! There was little to no disagreeing and whining during the entire trip. We all got along about as good as a family could. My biggest take away from the trip is that I am truly a blessed man and that moments with my wife and kids are precious. I thank God for giving me the wisdom to slow down and be intentional about soaking up the moments with my children. I love being a dad. Thank you God for the blessings you give me and for the generosity you lavish upon me and my family. You are the model of generosity. PreviousOnline Giving: How can it impact your Generosity Initiatives?